Cupboards Kitchen and Bath: Antique Tables - Made Daily! How often in the design industry do we find a product that is obviously not what it advertises or incredibly too good to be true. Got to give these folks props for proper labeling. It means a lot when a company is almost 100% nearly true about advertising an authentic reproduction antique. 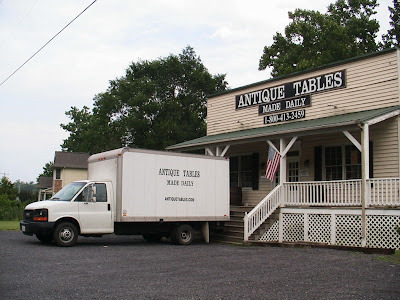 I think I will call them and see if they can give me an accurate and firm estimate on some modern traditional styled new old antique tables. *To give proper credit, these fine folks are in VA and make furniture from repurposed antique wood, a very green endeavor! I think you should send some business their way. I like the look of their building. If you do, I hope you will give us an update. Brian, they are absolutely on my furniture suppliers list. I was having a day yesterday and the oxy-morons cheered me up! I always prefer to use local shops for furniture like this- all about the heirloom pieces.